The New Jersey School of Conservation was excited to once again host the seventh grade class of the Ocean City Intermediate School for a week of exciting outdoor activities and classes. This trip continues a tradition of environmental education in Stokes State Forest going back over twenty-five years. After an introduction to the school’s rules and faculty, the students headed to their first activity: Action Socialization Experiences, or ASEs. In this team-building class students rotate through a series of challenging tasks. These tasks are designed so that no one person can complete them alone. However, the instructors are less interested in seeing the task completed as they are in having the groups develop skills vital to working as a cohesive team. The seventh graders found that they faced more problems than the puzzles in the woods. Effective communication requires not only talking and listening, but comprehension and truly paying attention to what teammates are saying. After tackling this issue and more, the groups headed out for individual classes. At the Confidence Course, the seventh graders were introduced to the School of Conservation’s policy of “challenge by choice.” Although NJSOC instructors do not force anyone to attempt any of the elements, if the student makes the decision to try we expect them to give 100% effort. Those on the confidence course had the opportunity to try out some elements new to NJSOC, not only building confidence in themselves, but in each other. Spotters on the ground provided helping hands and encouraging words, realizing that some positive peer pressure can help get students out of comfort zones and grow. During Questing, they learned how to combine their self-confidence and team-building lessons. The groups were given clues to lead them to a stash of treasure hidden in the woods and had to navigate from point to point to reach their goal. While self-confidence is important to develop, it should not get in the way of teamwork. Each student had a chance to take the lead during the expedition, but also had to work through the clues together to reach their goal. Stokes State Forest offers many trails to explore and the chance to marvel at the wonders of nature. Conservation Photography was a chance for the students of Ocean City to take a walk among the trees and capture a few of those wonders. On their walk, the students earned to utilize techniques like composition and the rule of thirds to highlight different perspectives of the natural world. As the next generation, the students’ views of the environment will shape future efforts to conserve and protect, so it is important for them to become familiar with wild places. Afterwards, they printed one of their own photos to take home and discussed the how photography can impact conservation of our natural resources. Survival pushed the students’ exploration and wilderness knowledge further. Their first lesson? Don’t panic. Panicking not only wastes precious time and energy, but it can also lead to injury and a worsening of the situation. The trick is to focus on and prioritize the four basic needs: air, shelter, water, and food. Given the cold weather currently gripping the area, the students also learned some basic fire-building techniques and fire safety rules. Preparation is key in survival as one never knows when these skills may be needed. 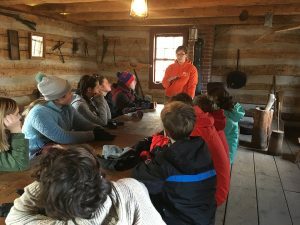 During their stay, students also got the chance to learn about early American lifestyles in Pioneer Life and Metalsmithing. While the latter introduced the students to the process of learning a trade, the former talked about the familial aspects of daily, pre-industrial life. The Pioneer class toured the DeGroat cabin, a 19th century Dutch cabin built by John DeGroat for his family. The students discussed the problems that the DeGroats might have faced living in post-Civil War New Jersey, including locating water sources and local agriculture. They were also able to have a sweet treat and make “Johnnycakes” on an authentic cast iron stove. Students in Metalsmithing were able to become apprentice smiths and try their hand at the two different smithing trades. For their whitesmithing project, they used hammers and tacks to create a tin sheet pattern of their choice. Their blacksmithing project needed another pair of hands for each student to shape an S-hook. While one student worked the bellows to stoke the fires, the other student worked with the instructor at an anvil to bend an iron bar into the proper shape. Realizing that the work was harder than expected, the students were happy to take their projects home rather than stay on as apprentices. After a hard hike to Sunrise Mountain and back, the students were ready to head home. The educators and staff of the New Jersey School of a Conservation would like to thank the coordinator, Frank Butterick, and all the teachers for making this visit possible yet again. We wish the seventh grade class of the Ocean City Intermediate School the very best in their future endeavors, and look forward to the arrival of next year’s students.